If you are reachable from the Internet, attackers using hosts all over the world will be making SSH connections and trying to guess passwords. You might want to consider some access control, in which hosts or blocks of IP addresses in specific lists are blocked out or are the only ones allowed to connect. Be aware that this can only provide limited protection, the recommendations on the previous page for using cryptographic authentication and disabling root access are crucial first lines of defense. If you keep your server patched and configured carefully, and you have strong passwords and SSH key pass phrases on all accounts, you can feel reasonably comfortable. You might want to use access control just to more quickly frustrate the attackers. They will move on to what appear to be weaker targets and they won't clutter up your logs. However, if your primary interest is in reducing the number of attempted captured in your logs, you will find that most forms of access control will not accomplish that. Packet filtering is the only method that won't show up in your logs, unless, of course, you specifically configure it to do so. SSH access control applies in the sequence shown in the following diagram. Notice the multiple opportunities for Syslog messages: from the kernel, from the SSH daemon (at multiple times during the connection or attempted connection), from the PAM modules, and from the shell or command executed through the SSH connection. This is obviously the first step — packet filtering happens in the kernel before the datagram can be passed to the user-space service. The point of PAM is to control what users have to do to authenticate. Type UNIX passwords? Offer Kerberos tickets? In what order and combination? The point of the Allow/Deny rules for both users and groups in sshd_config is to control which users and/or group members are allowed to authenticate, and possibly from which client hosts. It doesn't really matter whether the PAM rules are applied before the Allow/Deny rules or vice-versa, because unless you specified something illogical, the result is the same — multiple ways to deny access. The syslog messages on the server should indicate why the connection was refused. Note that a single connection may generate multiple syslog messages, one from the SSH daemon and one from each PAM module it uses. Access control rules lead to more log messages, not less. This is a big topic. For Linux, see the Netfilter/iptables documents at netfilter.org. # The "recent" module dynamically creates a list of IP addresses. # that have sent a TCP/SYN packet to the SSH port. # when you try to connect to a host not running that service at all. See the ipt_recent module web page for more details. I would not be allowed to do that if the connection rate throttling were in place! Yes, I know, I probably should make a tar file, then copy it over and extract it, but I prefer to do it the above way. Some times many files have been changed, so many SSH connections would be made for all those scp commands. Other rules could be inserted before those rules to allow arbitrarily many fast connections from specified IP address blocks. This would be fine to allow connections within an organization, but it could not be used for users working from home or on the road (hotels, Internet cafes) as you could not predict their IP addresses. # IP address blocks. These rules MUST appear BEFORE filtering rules. Denyhosts is a script to watch the sshd logs and automatically add attacking hosts to a black-list maintained through entries added to the TCP Wrapper control file /etc/hosts.deny. A big advantage of Denyhosts over the packet filtering techniques shown above is that it uses authentication failures, as shown by the logs, instead of simple TCP connection rates. This means that while it is more complex, you are less likely to unintentionally lock yourself out. You can run Denyhosts as a daemon, constantly monitoring the Syslog contents to add a host to the black-list as soon as it reaches the threshold of SSH authentication failures per unit time. Alternatively, you can run Denyhosts every so often via cron. The pam_abl PAM module can automatically add a password-guessing host to a black-list. You will have to experiment to verify whether your SSH daemon uses PAM by default. 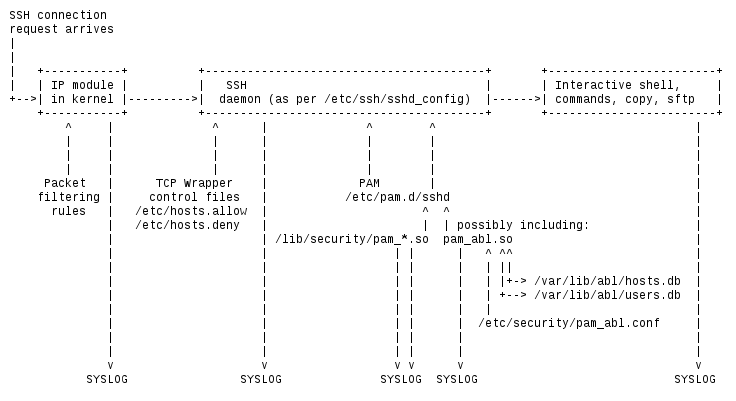 Hint: see if the syslog messages from sshd are associated with any from PAM rules. If the SSH daemon does not already use PAM by default, you should be able to add the following line to your /etc/ssh/sshd_config configuration file. # and then purge them. # consecutive authentication failures in one hour, or 30 in one day. # Keep them in the black-list for two days and then purge them. # service attacks caused by remote password guessing.